On September 10, in the lingering summer heat, the AIKI NEWS staff visited Morihiro Saito Shihan, head of the Aikikai Ibaraki Dojo and caretaker of the Aiki Shrine at Iwama, Ibaraki Prefecture, Japan, the residence of O-Sensei. 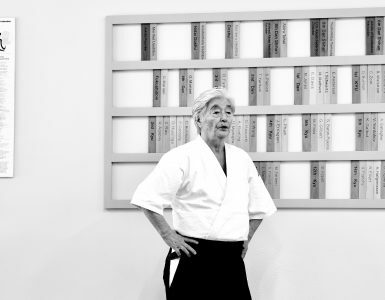 We asked Saito Sensei about his days spent with O-Sensei, his teaching method, his advice for practitioners of Aikido, etc. Present at the interview were several high-ranked students of the Iwama Dojo who had just finished their Sunday morning training as well as two guests from Iwate Prefecture. On September 10, in the lingering summer heat, the AIKI NEWS staff visited Morihiro Saito Shihan, head of the Aikikai Ibaraki Dojo and caretaker of the Aiki Shrine at Iwama, Ibaraki Prefecture, Japan, the residence of O-Sensei. 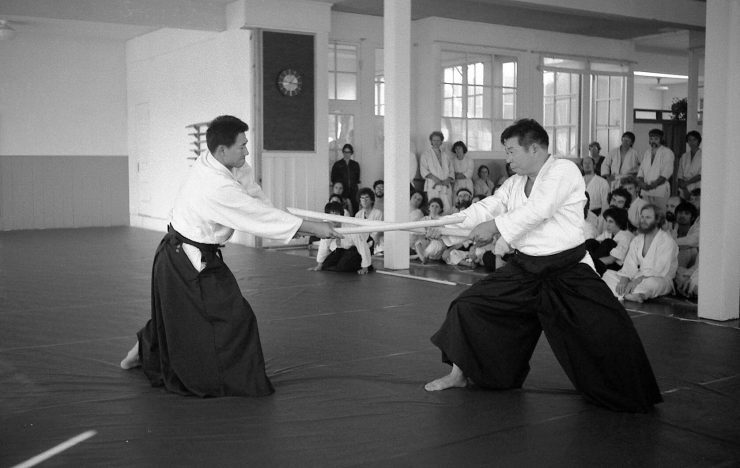 We asked Saito Sensei about his days spent with O-Sensei, his teaching method, his advice for practitioners of Aikido, etc. Present at the interview were several high-ranked students of the Iwama Dojo who had just finished their Sunday morning training as well as two guests from Iwate Prefecture. The interview was held in a family-like atmosphere graced by the hospitality of Mrs. Saito. Editor: Saito Sensei, I understand you met O-Sensei shortly after the war. 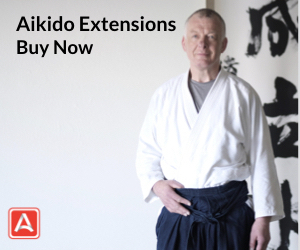 How was it that you decided to begin studying Aikido? Would you please describe your memories of that period? Saito Sensei: When I was a youngster I used to admire the great swordsmen just like everyone else. I would buy story magazines and read about people like Goto Matabe and Yagyu Jubei since when I was growing up before and during the war if a boy didn’t know Judo or Kendo he was ashamed. Naturally, Kendo and Judo were taught as a part of school education, and I chose to practice Kendo. Then came the end of the war. At that time you couldn’t carry a weapon. No one was permitted to carry even so much as a small knife. So I began to go to the Shudokan Hall in Meguro as I thought it would be dangerous if I didn’t know some kind of technique. In Meguro there was a teacher of Shinto-ryu Karate. He was a professor at Nihon University. I would go there and train hard at Karate. Because of my family situation I was working in Tokyo at that time. Anyhow, it was frightening up there and I was afraid to go. I had a very strange feeling and it was eerie but still some of my friends and I agreed to go up there and have a look. But my friends got scared and didn’t show up. So I came alone. It was during the hot season and I came in the morning. O-Sensei was over here doing morning training. His house was over there. Minoru Mochizuki who went to Italy and France many years ago, was sitting over there. “Sensei’s over there,” he said to me, and when I jogged over here, Akio Kano, Tadashi Abe, who went to France in the early days, and one of the sons of the famous Ishihara Industry family—the three of them were training with O-Sensei. Then I went into what is today the six-tatami mat room and while I was sitting there, O-Sensei and Mr. Abe came in. When O-Sensei sat down Mr. Abe placed down a cushion for him immediately. He really moved fast in helping O-Sensei. Then he stared at me. 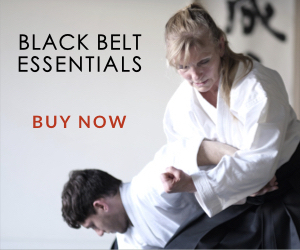 I didn’t have the least idea that a martial art could serve society and people. I just wanted to become strong. Now I have come to understand but at that time I didn’t understand at all. I think O-Sensei was already spiritually advanced at that time. I had been practicing martial arts just to become strong. When he said “for the benefit of society and people” I doubted how a martial art could serve that purpose, but as I was eager to be accepted I unwillingly answered, “Yes, I understand.” As I stood on the mat in the dojo rolling up my shirt sleeves thinking to myself, “Well, since I’ve come all the way here I might as well learn a couple of techniques,” O-Sensei said, “Come and strike me!” So I went to strike him and tumbled over. I don’t know whether or not it was kotegaeshi or what, but I was thrown. Then he said, “Come and kick me!” When I tried to kick him I was gently overturned. “Come and grab me!” I tried to grab him judo-style and again I was thrown without knowing how. My shirt sleeves and my pants ripped. Sensei said, “Come and train if you like.” With that he left the mat. I felt a sigh of relief to think that I was accepted since Sensei told me to come and train if I wanted. But Mr. Abe said to me, “O-Sensei can judge people. From what he said it looks as though you’ve been accepted. But we have an organization named the Aikikai and we can’t accept you without their discussing the matter. Wait for three days. 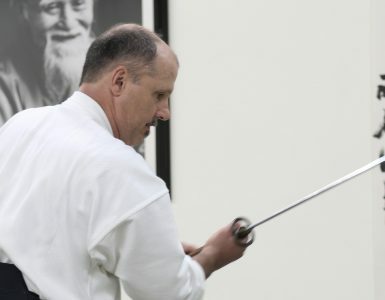 Recently a man came from Hokkaido and said, “I am going to practice Aikido, do or die! ” We told him to watch the class but he went home the next day and said that he wanted to think it over. I felt hurt being told that kind of thing by Mr. Abe so I said, “I will endure as long as my body lasts! ” It didn’t mean anything. Mr. Abe was just testing me. When I became a student I found Mr. Abe took good care of the junior students… he taught us in a kind, polite manner. I still appreciate it very much. In the same way that Mr. Abe was kindly taught like a brother by Mr. Tohei when he began, I was taught kindly in turn like a brother by Mr. Abe. Anyway, here I found an entirely new atmosphere. O-Sensei was somehow awe-inspiring to me. Though his body was small… it is something I can’t express. His eyes twinkled and there was something gentle in his severity when he spoke. I made up my mind to learn at all costs. I began to train. It was painful and my body ached and I thought it would have been better to be beaten up in a fight. But when evening came I would go to the dojo again. Once when I had put a plaster on I was scolded by O-Sensei, “Idiot!” So at the dojo I removed the plaster and after the workout I would hurry to take a bath and put it on again. Whenever I would have a pained expression on my face they would torture that part of the body even more. While this kind of thing happened again and again I found myself absorbed in Aikido. As you know I studied Aikido under O-Sensei for a long time. It so happened that I accompanied him on visits to Osaka and other places. People in those places would say to Sensei, “Please let us have Mr. Saito. Please leave him to train with us.” Though I had many of these kinds of offers I did not want to leave O-Sensei’s side. I thought O-Sensei would live to be 100 years old. It was cancer. If he hadn’t suffered from cancer of the liver he would have lived to be 100. Was it 1969 (when he passed away?). Mrs. Saito: Not 100. O-Sensei used to say he would live to be 120. Coming here (to Iwama) the way I did, scared stiff and with such motives, I found a severe, polite and wonderful man in him that I had been seeking. I really came to like him. After that I would be thrown without knowing how and Sensei would be standing smiling. I thought it was some mysterious technique and I wanted to learn it. 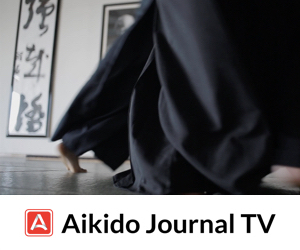 When I joined I found that people who practice Aikido are kind to the junior students. That’s why I came to like it. When you first met O-Sensei it was immediately after the war. I imagine O-Sensei was very strong and active. 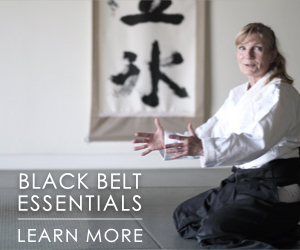 Would you describe O-Sensei’s teaching method… how he would teach on a day-to-day basis? Yes. After the war it was prohibited to have a gun or a sword; it was prohibited to have a sword at home, or a knife longer than 7 cm. The Ministry of Education told us: “We would like to preserve Aikido since it is the essence of Japanese martial arts. However, if you practice martial arts you will be reprimanded by the U.S. military. 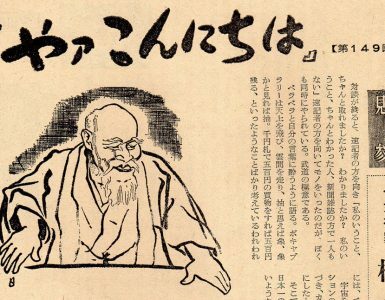 Therefore, we wish you to preserve the seed of true martial arts by referring to it as a health system or self-defense training.” O-Sensei couldn’t go anywhere and had to remain at Iwama. So we had to preserve Aikido at Iwama. During the war O-Sensei had been busy. 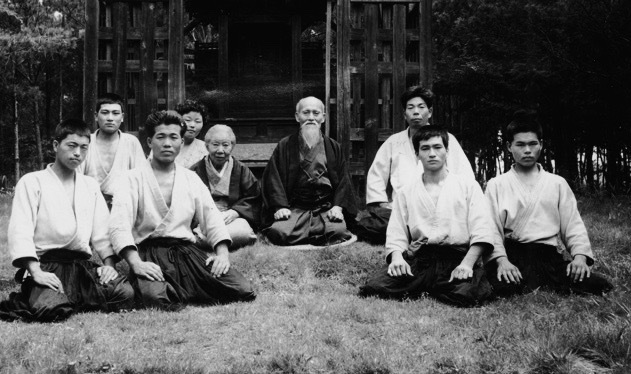 Though he had old students in many places, those who learned from O-Sensei were few. All the junior students learned from their senior students. We were lucky because O-Sensei himself remained at Iwama all the time. During the war he was ordered by the military to teach the martial arts he himself had studied as a method to defeat the enemy and to kill people. He was also asked by the military school at Nakano to teach lethal techniques. But the war ended and it became unnecessary to do so. O-Sensei was glad because he was finally able to absorb himself in the Aikido of harmony which he had been contemplating… Aikido according to his own belief. Morning after morning he would pray to the kami and instruct us. Since we had to eat, we also farmed. O-Sensei was so exuberant that he was not satisfied with using the normal farming tools that his students used. He ordered a blacksmith named Narita to make an especially heavy tool for him. He also carried double the weight of rice bundles on his shoulders compared to we students. We raised silkworms together, too… and we would harvest and plant rice. Since bicycle-carts couldn’t go up the bank of the school we would load the rice stalks on carrying poles and go up the bank with them on our shoulders. This article was prepared with the kind assistance of Jason Wotherspoon and Patricio Marshall.